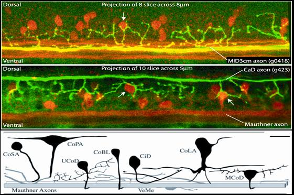 Sucharita Saha is studying the regeneration of axons in a zebrafish model of spinal cord injury. Regenerating Neurons Can be Visualized inside the Zebrafish Spinal Cord. A gap created by 2P axotomy is evident shortly after lasing a line inside the boxed region. Larval Zebrafish, shortly (5 days) after birth, exhibit navigational, escape and predatory behaviors. As such they are a great model for drug screening and as a neurological disease model. 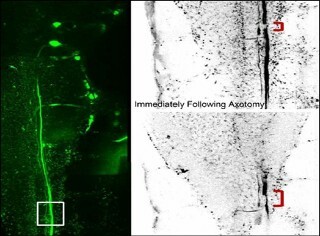 LOCOMOTOR BATTERY: After axotomy or laser ablation, larvae be can screened for their ability to execute a broad range of behaviors varying in terms of complexity and biomechanical performance. The most computationally demanding larval behaviors are the zebrafish prey capture Borla et al. 2002 and prey tracking behaviors McElligott and O'Malley 2005. the latter of which depends upon visual calculations in the optic tectum (see Gahtan et al., 2005).